Introducing our one of a popular kind Writable Wristbands! 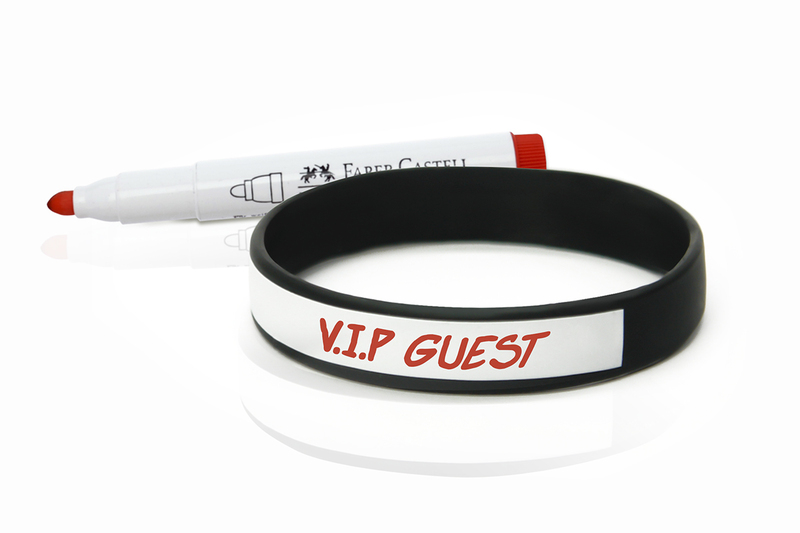 Writable wristbands are one of the most versatile custom wristband products we offer. With all the features of a standard silicone bracelet, they also have an added area where you can write your own message with a permanent marker or ball point pen! Writable wristbands are popular with schools, daycares, and event organizers, writable wristbands feature a large white writable area that can be written on with marker. You can choose to put a custom message with or without artwork on the other side, or have the writable area go around the entire band. We offer a wide variety of color choices, and free color matching! Basic Writable Blank – This is the most simple easy to order version. The "white" writable strip is approximately half the length of the band. Located on what would be the "Front" of the band. The color of the band shows above and below the strip, as well as on the back and inside of the band. There is no message on the back of the band. Great for color coordinating groups. The writable strip is only available in WHITE. For the band color, you can choose from a variety of standard or custom colors, create your own color swirls, add glitter or even glow in the dark. Full Wrap Around Writable Blank – The "white" writable strip wraps completely around the band. The color of the band shows above and below the writable strip and on the inside. Great for color coordinating groups and taking full advantage of the writable stip. The writable strip is only available in WHITE. For the band color, you can choose from a variety of standard or custom colors, create your own color swirls, add glitter or even glow in the dark. Basic Writable w/ Back Message – A great promotional item! The band has the writable strip on the front of the band, and you can add a custom message, name, logo, or slogan to the back. The "Back" message can be in one of our amazing message styles: Debossed (sunken in), Debossed with Color Fill (sunken in and filled with color), Screen Printed, Embossed (raised), Colorized Embossed (raised and color added). The "white" writable strip, located on what would be the "Front" of the band, is approximately half the length of the band. The color of the band shows above and below the strip, as well as on the back and inside of the band. Great for promoting an event and offering individual names to be added to each band (which is usually very cost prohibitive). The writable strip is only available in WHITE. For the band color, you can choose from a variety of standard or custom colors, create your own color swirls, add glitter or even glow in the dark. NO MINIMUM / READY TO SHIP - Basic Writable Blank – Available in 6 colors and ready to ship out. (Black, Yellow, Green, Red, Blue, Orange) This is a great and easy to order this version of our bands. The white writable strip is approximately half the length of the band, located on what would be the front of the band. The color of the band shows above and below the strip, as well as on the back and inside of the band. There is no message on the back of the band. Great for color coordinating groups. The writable strip is only available in WHITE. For the band color, you can choose from a variety of standard or custom colors, create your own color swirls, add glitter or even glow in the dark. NO MINIMUM / READY TO SHIP - Debossed Basic Writable w/ Back Message – Available in 6 colors and ships within days. (Black, Yellow, Green, Red, Blue, Orange) Your custom message on the back of the band is debossed (sunken in / engraved). The white writable strip on the front of the band is approximately half the length of the band. The color of the band shows above and below the strip, as well as on the back and inside of the band. Great for promoting an event and offering individual names to be added to each band (which is usually very cost prohibitive). The writable strip is only available in WHITE. For the band color, you can choose from a variety of standard or custom colors, create your own color swirls, add glitter or even glow in the dark. Your text and artwork are sunken into the band and then filled with a color to make them stand out from the main color of the band. Choose from a variety of colors for your bracelet and message styles available here. High-quality, durable, and non-allergenic, these industry-standard silicone bracelets are the perfect choice for your message.